This blog is named after a book by Jacqueline Jones Royster. While my goals for this blog are not quite as lofty as Ms. Royster's (promoting literacy and social change) I do intend to address ideas, philosophies, and policies that need to change. Since I consider myself a sociologist I will focus on anything social, which basically covers everything under the sun and then some. Topics will include my take on politics, music, sports, family issues, literature, to name a few. I am a middle-aged woman who recently relocated to the Dallas area after spending the last sixteen years in Long Beach California. I am originally from Flint, Michigan. Although I have lived in the West and I am currently in the south, my belief system is strongly rooted in my midwestern upbringing. I enjoy bowling and rollerskating whenever I get the chance. I also spend much of my time reading and listening to music. 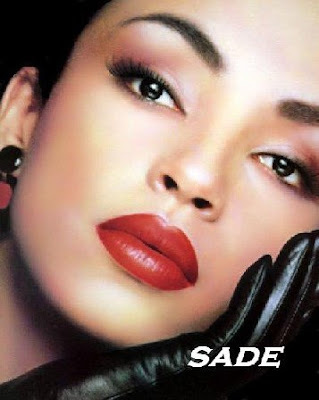 Last year I was seriously looking for Sade, I missed her sound and her style. I wrote about my search at the time click here. In the midst of all this frantic, "drop it like its hot" entertainment, I was missing the smoother song stylings of a true artiste. The last time I saw Sade on television was back in 2002 when I was living in Missouri. She was on tour at the time ( I knew there was no chance of her coming to my neck of the woods). I actually caught the "Stronger Than Pride" tour back in 1988 at Pine Knob in Michigan and the show was absolutely spectacular. Sade was on David Letterman last night performing the song "Soldier of Love" from the CD of the same title. Letterman announced that Sade had sold 50 million albums worldwide and I was literally shocked. Since she showed up on the music scene she has recorded only seven albums, including this one. Sade's performance was awesome as usual. When Letterman came out to thank her for appearing, you could tell they had a genuine fondness for each other. They hugged awkwardly and shook hands, both smiling shyly. I really hope she sticks around for a while this time. "Keep the faith, baby." Adam Clayton Powell, Jr.
"Potential powers of creativity are within us and we have the duty to work assiduously to discover these powers." Martin Luther King, Jr.
December 29th is the fourth day of Kwanzaa or Ujamaa [OO-JAH-MAH] which represents "Cooperative Economics". This principle call on us to To build and maintain our own stores and other businesses and to profit from them together (Red Candle). 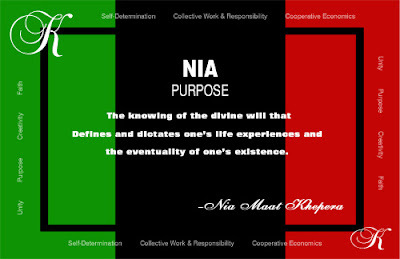 The third guiding principle during the Kwanzaa Celebration takes place on December 28th, Ujima [OO-GEE-MAH] or "Creative Work and Responsibility". To build and maintain our community together and make our sisters' and brothers' problems our problems and solve them together, represented by a green candle.This principle recognizes that we are collectively responsible for the well being of everyone within our community. It is up to us to nurture and care for one another. December 27th is represented by the second guiding principle of Kujichagulia [KOO-GEE-CHA-GOO-LEE-YAH] which stands for "Self-Determination"- To define ourselves, name ourselves, create for ourselves, and speak for ourselves, rather than to be defined, named, created for, and spoken for by others. Independence, freedom of action, unilaterally, freedom of choice, freedom of thought, emancipation, self-expression, individuality, national status, autonomy, self-government, self-sufficiency, independent means, competence, and prosperity. This principle is represented by a red candle. Plan and prioritize a list of goals that you hope to accomplish throughout your life. These can be short, medium or long term in nature. Begin the practice of Kujichagulia in relation to achieving your list of goals. Picture yourself achieving each listed goal in your life. Studies have shown that positive imaging in the mind actually allows goal seekers to obtain more confidence in the possibility of achieving their goals as well as physically relaxing their bodies and minds in preparation for that action. Learn from your mistakes by the results and outcomes of your previous decisions. The adage says that you can never learn from failure unless you have failed and you can never fail unless you have tried. Making decisions and learning from them is a part of growing and living and is also a key factor in learning self-determination. Grow in knowledge in a variety of areas and subject matters. You should continue to seek knowledge wherever and whenever you can. Knowledge is the root of all power and power within oneself is the root of self-determination. Keep your physical body healthy and active. A healthy body creates an healthy balance between emotions and intellect. To keep your mind sharp, you must consistently eat a healthy and stay physically active throughout your entire life. The Happy Go Lucky Bachelor. Images on this blog are taken from the web. If you own rights to any of these images and do not want them to appear on this site, please contact me at pjazzypar@yahoo.com and I will remove them promptly.